Earth Day,…. every day is earth day for bicycle riders. Not just people out for fun or enjoyment, (which it can be). Many people are out there on bikes for a lifestyle. If you use your trike or bike for running errands, or commuting to your workplace, you’ll see the difference in you and your “vehicle” cost. The average cost of a bike is $500. Trikes are a little more. They will pay for themselves in less than a year if you use them for just 10% of your errands. Needless to say all the health benefits to you and everybody around because of one less car. Your carbon footprint goes down and your life expectancy goes up. How nice is that? Less traffic on the road, less pollution, less congestion and less noise. Here’s a statistic for you: If an average family of four gave up their car for a year, they would save $8000. Makes you think about that second car doesn’t it? Putting Florence, Oregon in perspective, our town is basically flat. It’s roughly three miles from the bridge at the south end of town to the Fred Meyer megastore. There is also a bike lane for the most part on coast Highway 101. Also the connector streets like Kingwood, Oak, and Spruce have dedicated bike lanes on them … for walking and cycling. We also have “bike paths” that make “cutting” through town easy and fast. The Chamber of Commerce, city hall and the Bike shop have free maps that show the streets. As far as excuses NOT to ride, if you can get in or out of a recliner, you can pedal a recumbent trike or bike. You can even get electric assist on these machines. 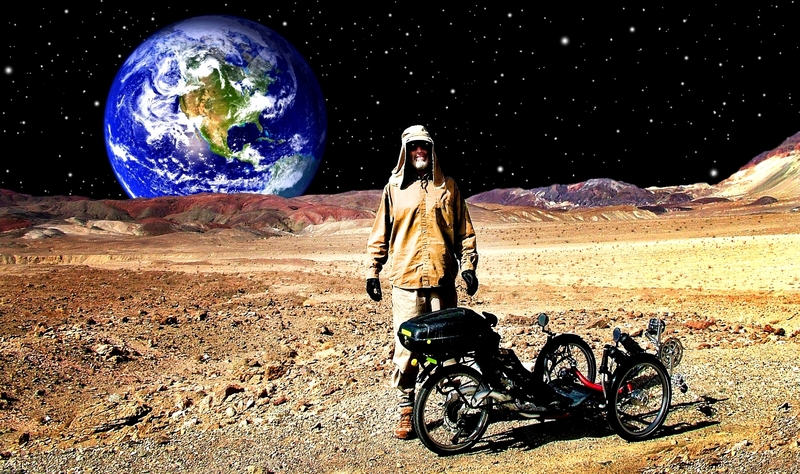 The average recumbent rider is male, bearded, and 65 years old! Most any bike can be fitted with a rack to carry things, efficient L.E.D. lights and fenders (to keep you dry). Many bikes now are also made specific to female proportions. So with gas nearing $5.00 gallon this summer of 2011, heres your excuse to do good for the Earth and yourself. Europe has been doing it for years, where gas is $5.00 liter. Follow their lead and get on your trike or bike and ride.